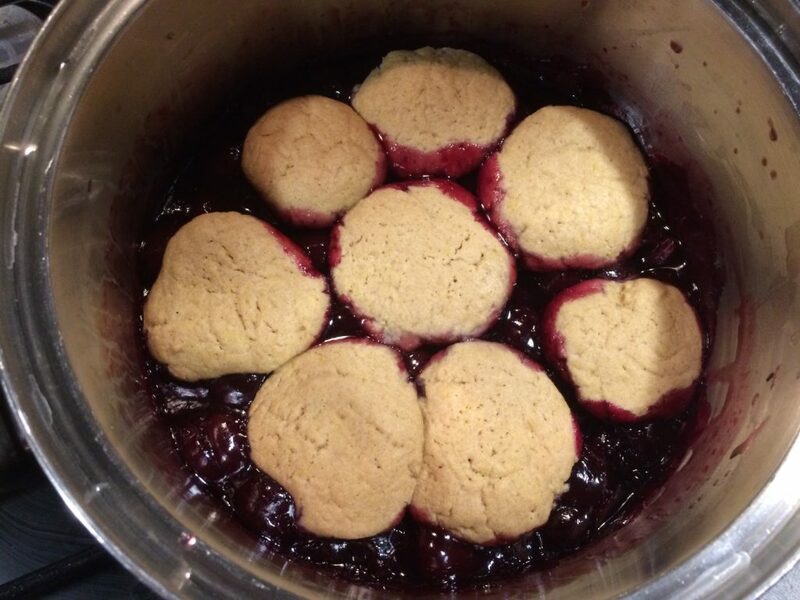 I recently discovered fruit grunts: stove top cobblers that don’t require an oven, or much effort! I had a bag of cherries hanging out in my freezer, and decided to adapt this Farmer’s Almanac orchard fruit grunt recipe to make it vegan, gluten-free, and lower in sugar. This worked well for a Saturday night dessert emergency! Farmer’s Almanac says the name comes from the sound it makes while cooking, but I have never had my food “grunt” at me before? Personally, I think the name comes from the sound people make while they’re eating it! This is one of my new favorite desserts. In a small or medium saucepan with a well-fitting lid, mix the cherries, arrowroot, sugar, and salt, and cook over medium heat. If the fruit does not release much juice, add 1-2 tbsp water to help make a sauce. Let the fruit simmer on low or medium-low while you mix the dumplings. In a bowl, mix dry ingredients together, and then cut the butter into the mixture with a fork, your fingers, or a couple butter knives, until the mixture looks like coarse crumbs. Add creamer, 1 tbsp at a time, until just moistened. At this point you can mix the heck out of it. You want to develop the proteins in the flour to help bind the dumplings together, and you don’t have to worry about making the pastry tough like you would with gluten-containing treats. Gluten-free flour can take the abuse, as long as they don’t have added gums. If you’re using a flour blend with added gums, you should be able to stop at the “just moistened” step, and you’re ready to form your dumplings. Divide the dough into 6-8 balls or fat pancakes, and drop them right onto your simmering fruit. Cover the pan, turn the heat down to low, and resist the urge to peek for at least 15 minutes! After 15-20 minutes, the dumplings should be firm to the touch. Remove the lid, turn off the heat, and let them cool right in the pan. Serve warm or cold with whipped cream or vanilla ice cream. Sugar: The sugar in the fruit mixture helps fruit release their juices, and gives the sauce a nice texture. However, it could be omitted for lower sugar options. Same with the dumplings: most gluten-free flours (especially teff and sorghum) have a lot of flavor, and don’t necessarily need sugar if you don’t want a very sweet dessert. Sugar helps a little with the texture chemistry that happens in a baked treat, but it would still be delicious without, especially if you’re adding ice cream or whipped cream! Gluten-free flours: each one behaves a little differently. I’ve successfully substituted teff for sorghum and vice versa, but your mileage may vary. Many pre-mixed gluten-free blends will contain binders (xanthan gum, guar gum, psillium husk, flax seed, etc) to help make up for the lack of gluten. These can make the dough tougher or chewier. If that happens, just serve it with extra ice cream. Nondairy creamer: we love Califia Farms Vanilla Almondmilk Creamer so much that we buy shelf-stable cartons by the case and keep it in the pantry for coffee and spiced chai, so we never have to worry about stores not selling it wherever we’re at. But for non-dairy baking, it’s easy to substitute any other non-dairy milk, or even water, if you add a splash of vanilla extract as well. Most recipes I found online were for much larger quantities of fruit. This recipe was perfect for two people, but if your family is bigger, you’ll probably want to double or triple it, and use a medium saucepan or a skillet. Someday I will test this out in a pressure cooker, a rice cooker, and on a camp fire. Did you hear about Reddi-Wip’s new non-dairy whipped cream??? It’s so good! And we’ve seen it at most of the big chain stores around here! It was PERFECT on this dessert. There’s also a coconut variety we haven’t tried yet.